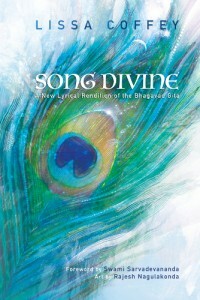 I’m very happy to announce that my new book is now available: Song Divine: A New Lyrical Rendition of the Bhagavad Gita. Check it out at www.SongDivine.com. This book is very close to my heart. I have learned so much from the Bhagavad Gita. It contains everything we really need to know to live a purposeful, spiritual life filled with meaning. I feel very fortunate that Swami Sarvadevananda, my teacher, and the head minister of the Vedanta Society of Southern California (vedanta.org) wrote the foreword to Song Divine. The Bhagavad Gita is a holy book for all times, places and cultures. It doesn’t belong to one person, nor does it address any one group of people. It is a scripture for all the world and everyone in it, wherever they are in their spiritual quest. The Bhagavad Gita has inspired many people with its powerful teachings and profound truths. It draws from the wisdom of the Upanishads, and wraps up all the essence of this wisdom as a practical guide to living. The deep spiritual lessons are as applicable in today’s modern world as they were back in the time of Krishna, more than 5,000 years ago. It’s no wonder that the Bhagavad Gita, originally written in Sanskrit, is the second-most translated book in the world after the Bible. There are countless versions, in many different languages, and with a variety of commentaries on the verses. And now Lissa Coffey, or “Parama” as she is known to us here at the Vedanta Society, has brought us her own very special version of the Gita. This Gita is ideal for the western seeker in that the verses have rhythm, and they rhyme, making them very easy to both understand and memorize. Keeping the words of the Gita in the mind helps us to focus on what really matters in this life, and to remember the vital teachings that Krishna imparts to his friend Arjuna during their intense discussion on the battlefield. The Bhagavad Gita is a part of the Mahabharata, a great epic filled with stories and philosophy. The Mahabharata contains 97,400 verses, while the Gita comes in at 700 verses. The Gita is said to be the spiritual core of the Mahabharata, expressing the same concepts in a much shorter narrative. Adi Sankaracharya, who consolidated the doctrine of Advaita Vedanta, was the first to recognize the greatness of the Bhagavad Gita, and wrote his wonderful commentary on it, thereby establishing the Gita as one of the fundamental texts of Vedanta. The one theme that runs through the entire Bhagavad Gita is that the purpose of life is to realize our essential Being. In other words, to know and understand who we are, and why we are here on this earth. It may be called Enlightenment, Nirvana, Self-Realization, Awareness, Oneness – there are many different terms for this experience. But when we achieve it, we recognize that the experience, by any name, is the same for each of us. I first met Lissa at the Vedanta Society in Santa Barbara. She quickly started attending our weekly Bhagavad Gita classes at the Hollywood Temple. Lissa, through her many books, has been able to bring some very big spiritual concepts to a mainstream audience by explaining them in a way that is easy to understand and also easy to apply to the modern day lifestyle. I’m very pleased that Lissa has embraced the Gita in this way, and I know that many more people will be blessed with Krishna’s valuable teachings because of her loving efforts in creating this book.